The president shouldn’t be writing checks to the parents of slain service members. It’s highly inappropriate for the president to write a check to the father of a slain service member. 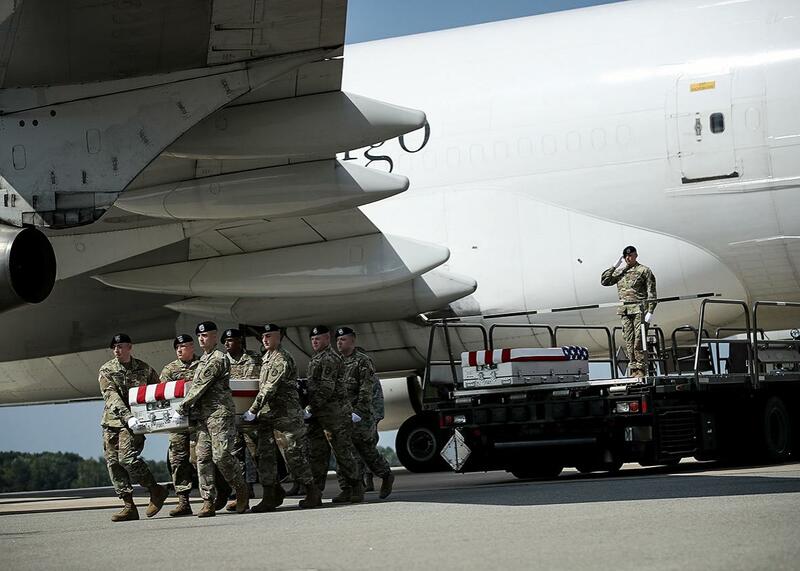 A U.S. Army carry team carries the transfer case containing the remains of Sgt. Jonathon Michael Hunter during a dignified transfer ceremony at Dover Air Force Base on Aug. 4. I’d just married the love of my life; I thought I was ready for the next step, but that was only because I had absolutely no sense of how it would change me. My new husband, a naval officer, sat me down to talk about being a beneficiary of his government-mandated death gratuity in case he was killed while serving. He was preparing to add my name to his “Page 2,” as it’s called in the Navy—because it’s the second page of a complicated document that specifies who’s to be informed first in case of death, and what percentages of the gratuity and the military’s low-cost life insurance goes to which family members. Our conversation took place about four months after 9/11, when his forward-deployed overseas squadron was preparing for a lengthy carrier cruise through the Persian Gulf. The idea of death seemed much less theoretical than it had when we were slicing into our wedding cake. As I’ve discovered after 16 years of meeting and writing about military families from all of the service branches, matter-of-fact, practical discussions between newlyweds about one partner’s death and how it might be handled are nothing unusual. Before a deployment there can even be mandatory workshops to force conversation between spouses about who to name as beneficiary and how the notification process would play out in a worst-case scenario. For a service member, naming a beneficiary is one thing—maybe the only thing— that makes the unwritten contract between them and their country tangible. It’s a weighty trust: In exchange for their life, the government will take care of their loved ones, who then become known as Gold Star family members. Which is one of the reasons why President Trump’s recently reported offer of a personal payment to the father of a slain service member destabilizes the entire system. The service member’s mother was listed as his Page 2 beneficiary, but according to news reports his father told the president, who called him to express condolences, that he “didn’t have two nickels to rub together.” Trump’s offer of a $25,000 personal check seems to have come after that. The father said he never actually received the check, but according to the White House, it was sent recently. There’s no way to know what goes on within a family, but if the slain service member designated his mother to receive a payout for what is basically the calculated value of his life, and decided his father should not receive any benefit from his death, there was a reason why. (Errors certainly do occur, but typically only when a service member has not kept his or her Page 2 up-to-date and an ex-spouse receives the benefits.) Now there’s a precedent for a service member’s final wishes to be set aside—or superseded by political machinations and perceived public opinion. This corrodes the connection between military families and the government. More alarming, though—and separate from the role of the beneficiary—is that President Trump’s personal payment to this Army dad may ultimately threaten the unity of American military families. There are plenty of differences within the military family community already: the perceived chasm between officers and enlisted troops; socioeconomic class; political beliefs; and the usual variations in background and behavior that emerge when you throw together people from every farm, factory town, city, and suburb of this diverse country. But difference does not equal division, and I’ve seen that what we have in common—the shared experience of service—takes precedence. The feeling of solidarity kicks into high gear in times of trouble, like long deployments, and especially when a service member dies. You know that could have been you draped over the coffin, sobbing, or numbly receiving a folded flag at Arlington. Among my cohort of military wives, everyone knows someone who has died while serving. And we also know what to expect—financially and institutionally, if not emotionally—when the worst happens. All of us have imagined ourselves in that position. As a former outsider to the military who first examined it much as an anthropologist studies the alien ways of faraway cultures, I’ve come to see service to the country as a merit-based equalizer among all of the folks who are drawn to it. It’s no different in death. Everyone who makes the ultimate sacrifice is treated the same way. Their survivors are, too. If you know a formerly happy family whose sons, daughters, aunts, and uncles are no longer on speaking terms after an unequal or preferential distribution of money caused a rift, then you already know where this can go. When money is offered outside of the institutional framework that’s already in place, military families are going to start looking at who receives money and who doesn’t—and why. Was it based on rank? Or race? The popularity of the mission? Quality of the plea? These are questions that distract from a common purpose, affect morale, and—when it interferes with “family readiness”—may lower retention rates for service members. Ultimately, this has the potential to harm national security. But this just begins to get at how inconsistently meted personal payouts from our commander in chief undermine the sense of shared purpose among military families. If one survivor is more “valued” than another, what does that imply about the government’s standard death compensation? Is the extra money an admission of guilt on the government’s part? Was the family member who didn’t receive the benefits shown to be less deserving, or lying? Should that be investigated or adjudicated? The president’s offer of a private payment to a surviving military family member upends our widely understood set of expectations and sets a dangerous precedent. By putting a subjective value on the lives of our loved ones, it triggers an emotional earthquake among military families—because we are forced to understand that, for this administration, some service members might be more equal than others.